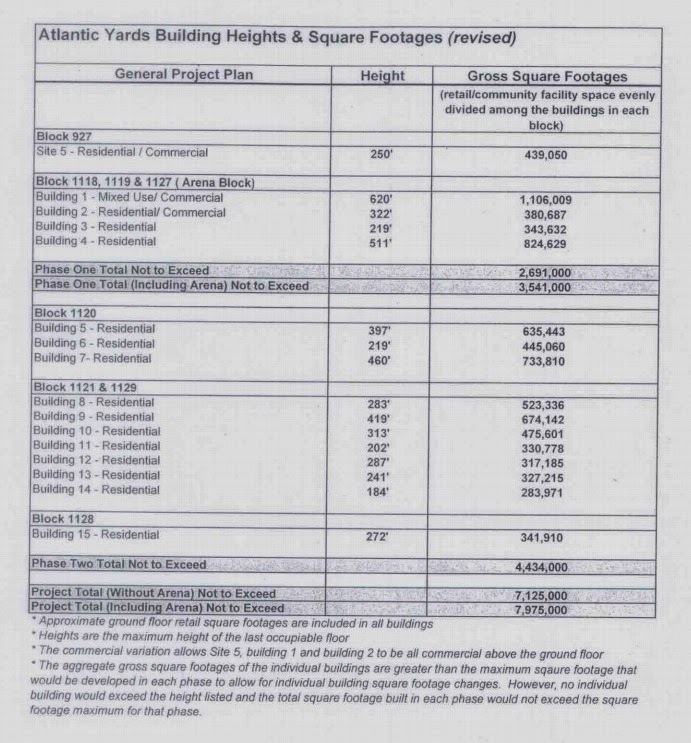 NY1's update on Atlantic Yards parrots "new neighborhood, "public park," "30 lawsuits"
NY1's Atlantic Yards Gets New Name for New Life, broadcast yesterday, is a remarkable, if perhaps unsurprising by now, piece of lapdog journalism. It's keyed to the topping out of the 550 Vanderbilt condo and the 535 Carlton "100% affordable" building, but the new name, of course, was announced in 2014. The development initially was called Atlantic Yards after the Long Island Rail Road yard beneath Atlantic Avenue, but after some 30 lawsuits attempting to stop the project, the developers think the original name has too much history. Pacific Park refers to Pacific Street, which is being de-mapped and turned into a public park. It's a marketing strategy to attract buyers for condos that run from $845,000 for a one bedroom to nearly $7 million for a penthouse. In contrast, the 298 rental units at the Carlton building will be 100 percent affordable, supported by the city's affordable housing program. In a rather cryptic announcement, the Brooklyn Nets, claiming they were "committed to providing our fans with the best possible experience at Barclays Center," yesterday said they'd start opening doors to the Barclays Center starting Monday 60 minutes prior to tip-off rather than 90 minutes. No explanation was announced, but NetsDaily quoted a spokesman for the team and arena as saying, "There were a very minimal amount of people coming early except for the big games, when we will continue to open doors 90 minutes before tip-off." That suggests some variability, and bolsters suspicions that this is a response to lesser fan interest as well as an effort to save money at a time when arena finances are hurting. As NetsDaily noted, some fear it might foster delays in getting through security. There's actually significant news in BISNOW EXCLUSIVE: MARYANNE GILMARTIN ON PACIFIC PARK AND THE FUTURE OF MODULAR CONSTRUCTION, a cheerful pre-Bisnow-sponsored conference interview with Forest City Ratner's CEO. Not only does Gilmartin continue to blame former partner Skanska--described incorrectly as the original owner of the modular plant, which was a joint venture--for delays in building the B2 modular tower, 461 Dean Street, Forest City plans to sell the factory it reopened last year after buying out Skanska's share. That means that, not only has Pacific Park joint venture partner/overseer Greenland USA apparently nixed modular construction for the rest of the project, Forest City has been unable to attract new business for apartments or even components. At the end of November, employees were sent a 90-day notice about the plant shutting down; presumably by then the remaining modules for B2 would be finished. As first revealed yesterday by DNAinfo after comments by New York City Schools Chancellor Carmen Fariña, the 616-seat school at the 27-story, market-rate B15 tower (aka 664 Pacific) planned just east of Sixth Avenue between Dean and Pacific streets will become a dedicated middle school. That's a victory for the local elected officials and advocates who sought a standalone middle-school, under the banner of MSOneBrooklyn, saying that the lack of higher-quality seats (not spaces in District 13) drove families away. A lack of space for elementary school students remains as well; hence the original, if tentative, plan, for a mixed school. See debate here. According to a post on Brooklyn Community Board 6's Facebook page, at some point next month applications will be available for the 181 subsidized apartments planned for the B2 modular tower, aka 461 Dean Street, flanking the Barclays Center at Flatbush Avenue. That implies that the building, which is several floors below its projected 32 stories, is on track to open this summer. The units will be spread among low- (73), moderate- (36), and middle-income (72) households, with rents for the few subsidized two-bedroom units ranging from under $900 to nearly $2900. (Half the building will be market-rate, and those two-bedroom units should cost well over $4,000.) See graphics below. The projected monthly rents below should be adjusted upward by about 4% (and possible more), given that the 2012 Area Median Income (AMI), upon which target percentages of AMI were calculated, has risen from $83,000 in 2012 to $86,300 in 2015. I published a version of this image in November 2014, after the Frank Gehry retrospective at the Centre Pompidou in Paris, but the shot below, from the updated Gehry exhibition at the Los Angeles County Museum of Art that I recently visited, provides new perspective on the 2008 version of what was then called Atlantic Yards. When developer Forest City Ratner in 2008 released new renderings of the arena block, with the titanium-clad arena Site 5 was omitted. But Gehry, apparently, had designed a building. The last round of eminent domain for Atlantic Yards/Pacific Park is not going so smoothly. As the Real Deal reported yesterday, P.C. Richard, which owns part of the Site 5 site at the western end of the project footprint, has sued to block condemnation of the property, which is adjacent to a site owned by Forest City Ratner and occupied by Modell's. The state also will condemn the Modell's lease, as well, with a 250-foot tower encompassing 439,050 square feet, including office and retail space (and possibly residential). According to the Real Deal, a 2006 letter of intent (LOI) signed by P.C. Richard parent A.J. Richard and Forest City indicated that the electronics store would get comparable space in a new building at the project site. Forest City contends the LOI was nonbinding; P.C. Richard says it was ironclad. Something doesn't quite make sense. The sign posted yesterday, in the photo below, indicates that Sixth Avenue between Dean and Pacific Streets will be closed for two days, from 6 am Saturday through 9 pm Sunday either this weekend or next. However, the Atlantic Yards/Pacific Park Construction Alert issued last week stated that the closure would be simply for "one day," to allow for "Con Ed vault excavation and delivery of the Con Ed Vaults" for the B3 tower at the southeast corner of the arena block. At the same time, a Community Notice regarding the work--which was scheduled for last Saturday, then canceled for weather--indicated that it would proceed from 7 am to 4 pm. See excerpt below left. The Barclays Center is again recruiting workers, this time Concessions Counter Servers and Cashiers, with a starting pay of $11/hour. This represents a slight bump up from the $10.50/hour pay revealed last June, which is now the minimum wage for fast-food workers. Previously, there was a larger gap between the arena's $10.50/hour wage and the minimum wage of $8.75 (now $9). Note that hiring does not at all mean there is an expansion of jobs, just an expansion of the labor pool. And an expanded labor pool is not necessarily good for workers. Update: the Carlton Avenue Bridge sidewalk was cleared as of the morning of Jan. 27. I'm now on Instagram as atlanticyards_pacificpk_report and last night posted updates to yesterday's blog post about uncleared sidewalks after the storm. Update: By Monday night, the sidewalk on Dean Street was clear, but the Carlton Avenue Bridge sidewalk was not. There's significant frustration today, especially in Queens, regarding streets that remain unplowed after Saturday's storm. The photo at right, from this Instagram account, shows the sidewalk at 4 pm yesterday on Dean Street east of Sixth Avenue, site of the 664 Pacific development. Surely that's more than 14 hours after the snow stopped, thus triggering the responsibility to shovel. Also see this Instagram photo yesterday of Carlton Avenue between Dean and Pacific. Below, a video shot this morning shows the uncleared sidewalks on the Carlton Avenue Bridge between Pacific Street and Atlantic Avenue. "The original transaction had the modular company doing the construction work for B2," Meller said. "The original concept was that the modular company would take an assignment of the design, accept the design responsibilities, and then construct the work. That price was too high for Forest City." Instead, Forest City hired Skanska to construct the tower, assembling the superstructure, placing the modules, and connecting the building systems, among other things. Skanska blames Forest City for faulty design of the modular plan; Forest City blames Skanska's execution. Part of the Greater New York exhibition at MOMA PS1 in Long Island City (on view through March) is a piece called "Housing in New York: A Brief History, 1960-2007," by the Bronx-born artist Glenn Ligon. The piece consists of texts about the various places Ligon had lived by 2007, the date of the piece, which consists of paragraphs of text, not any photographs. It's notable that the last two places were in Prospect Heights, and Ligon's texts capture the neighborhood in transition, though not with complete prescience. The first, from 1995-2002, was 168 Prospect Place. "A one-bedroom brownstone floor-through on a quiet, tree-lined street," Ligon writes. "My neighbor Herbie jokingly called the area 'Dark Slope' because the complexion of its residents was dramatically different from that of those south of Flatbush Avenue in more affluent Park Slope." At the Community Update meeting on 12/9/15, I was surprised to hear 664 Pacific Street (aka B15) architect Jonathan Marvel describe the intersection of Pacific Street and Sixth Avenue as a "residential gateway," a designation reinforced in his slideshow (screenshot below). But Marvel was unaware--likely because his client didn't bother to tell him--that the "residential gateway" might, for a stretch, become an "arena gateway." Update: Hazardous weather means that Sixth Avenue will not be closed on Saturday as tentatively planned. The latest Atlantic Yards/Pacific Park Construction Update, covering the weeks of January 18 and January 25, should have been issued last Friday, as a preview. Instead, it came late Wednesday morning, more than one business day late. Sixth Avenue outside the B3 site (38 Sixth Avenue) between Dean Street and Pacific Street will be closed this Saturday--as tentatively planned--to allow for Con Ed vault excavation. Update: a notice this morning indicates the time will be 7 am to 4 pm. Sixth Avenue between Dean & Pacific Street will be closed during this time. 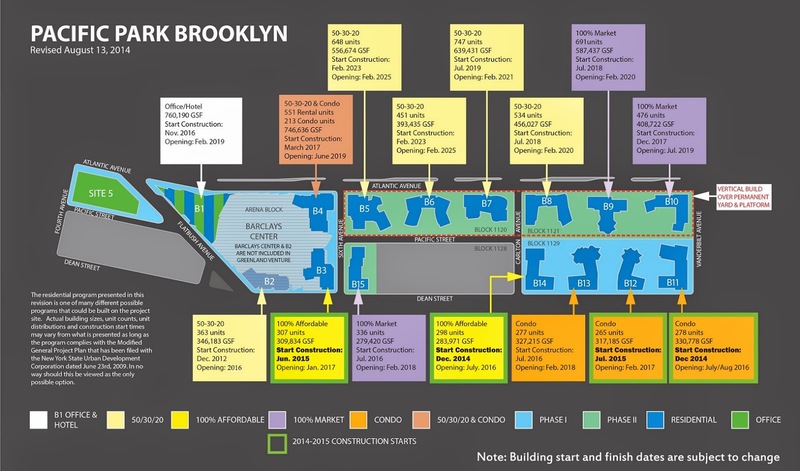 Atlantic Yards/Pacific Park in 2016: buildings finally open; others rise; what's the surprise? See Atlantic Yards/Pacific Park 2015 retrospective yesterday. Some of the big Atlantic Yards/Pacific Park 2016 news has already occurred. Owner Mikhail Prokhorov canned the Brooklyn Nets coach and demoted the general manager. But expect some effort at buzz, if not competitiveness, as the Nets hire new leaders and find new players. And, of course, an unresolved question, as Politico's Howard Megdal wrote, is whether Prokhorov, now that he owns 100% of the Nets and 100% of the Barclays Center operating company, will sell. The New York Islanders, after a slow start in drawing fans, have begun to do better, and as the playoffs approach might tick up further. But we won't know until late in 2016 whether, in fact, the Barclays Center arena will in 2015-16 reap the forecasted $55 million in net operating income, which would be a huge jump from the previous $38 million yet still would not allow much profit. After all, that also depends on the concert industry. Atlantic Yards/Pacific Park in 2015: Islanders arrive, Nets sink; buildings rise; modular revelation; a "new neighborhood... from scratch"? Yes, I know this is late, but it incorporates some early-in-2016 episodes that connect to 2015. The 2016 forecast will appear tomorrow. When I wrote my Atlantic Yards/Pacific Park 2015 predictions a year ago, I cited the likelihood of multiple towers under construction and the sale of Forest City Ratner's share of the Barclays Center and Nets. Indeed, the project is very much on the map, but the arena sale appeared to be a loss for the developer. Then again, parent Forest City Enterprises needed to divest so it could transition to a real estate investment trust, or REIT. Another seemingly big issue was the--now quickly forgotten--decision by the Democratic National Committee to hold the 2016 presidential nominating convention in Philadelphia, not Brooklyn, where logistics would have been much tougher.